In a brief change from the fiction I usually read, another of James Shapiro's histories of the events that influenced Shakespeare's writing. 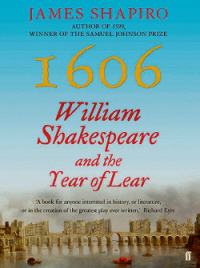 After 1599, we get 1606: William Shakespeare and the Year of Lear, with the plays that premiered that year being King Lear, Macbeth and Antony and Cleopatra. There's lots of outside elements big and small that seem to be reflected in those plays but inevitably most of them come back to the Gunpowder Plot of the previous year. I knew that Macbeth carried a lot of echoes of that, but Shapiro also finds possible links in King Lear, which would probably have been written by November 1605, but might have had amendments before it reached the stage, acknowledging some of the current events everyone was paranoid about at the time (the anonymous letter Edmund plants to frame Edgar might have given people flashbacks to one that revealed the plot to Parliament in time for it to be stopped.) The two very different versions of Lear in quarto and folio form are also discussed, changes which might have been made as the parameters of what was and wasn't appropriate to be staged changed. There's also a little-known story of an alleged assassination of James I, a rumour that spread with amazing speed throughout the country and sounds uncannily like the many false celebrity death rumours that make the rounds nowadays. Overall I found much interesting stuff here, especially since, as Shapiro points out in the opening, people seem less interested in exploring Shakespeare as a Jacobean playwright despite the fact that his company had a much closer relationship with James than with his predecessor.